So the arm of my existing glasses fell off last weekend. I say 'fell off'...it was one of those "Oh no! The arm of my glasses has fallen off - now I'm going to have to buy those ones I've been swooning over from Retro Peepers for months! Shucks!" So you get the jist. Apart from having to use my glasses as a monocle all week and getting weird looks in Asda, I wasn't too upset over the loss. For ages I have been searching for a company that sells reproduction vintage glasses to an optical prescription, which, yes, you've guessed it, don't break the bank! So when I found Retro Peepers on Instagram through someone I follow, I was overjoyed! 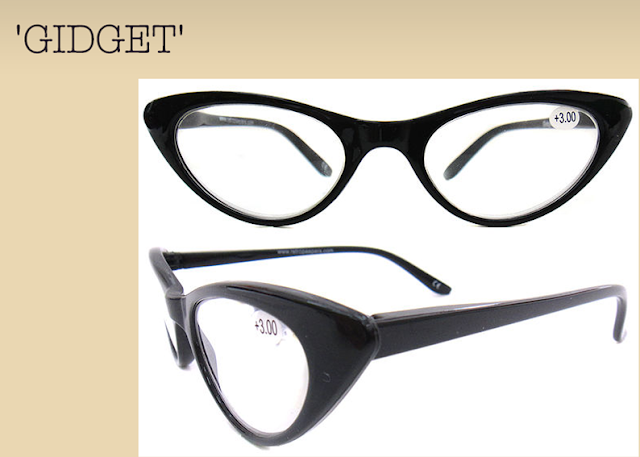 They have a huge range of glasses based on vintage designs to suit every face and budget! I was completely spoilt for choice! I decided to play it safe and go with one of their budget styles, just incase they didn't suit me. 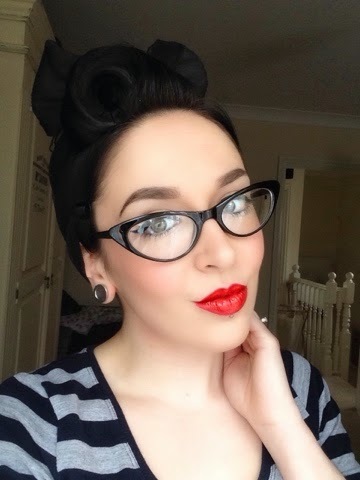 I chose The 'Gidget' frames in black for a measily £14! The process for buying prescription reading glasses or sunglasses from Retro Peepers was dead easy (something I was quite worried about!). Instead of choosing a reading strength (like you would a clothes size) you pick 'Regl' which stands for 'Reglaze'. You then pay for your specs at the checkout as per usual. I then emailed the lovely Annie who runs Retro Peepers (she was really helpful) and sent her a scanned image of my optical prescription from my Optician along with my Pupillary Distance measurement (or PD measurement). This is the space in cm between the center of your left and right pupil. If you are unsure how to get this measurement, Annie emails you a PDF on how to do this, which I found really helpful. You then chose your lenses via email. I went for single vision standard 1.50 plastic lenses at £13, but you can also have anti scratch/anti glare for £22. Once you have emailed over your prescription and chosen your lenses, sit back, relax and Retro Peepers will make your glasses for you. The ordering process and delivery was super speedy! I ordered my glasses on a Sunday evening and I received them the following Saturday. My new glasses are great. I love the style, the price (a bargain at £27) and the service. Everything about my experience with Retro Peepers was great and I cannot wait to order from them again. So if you are looking for affordable, vintage style eyeware, I highly recommend these guys!